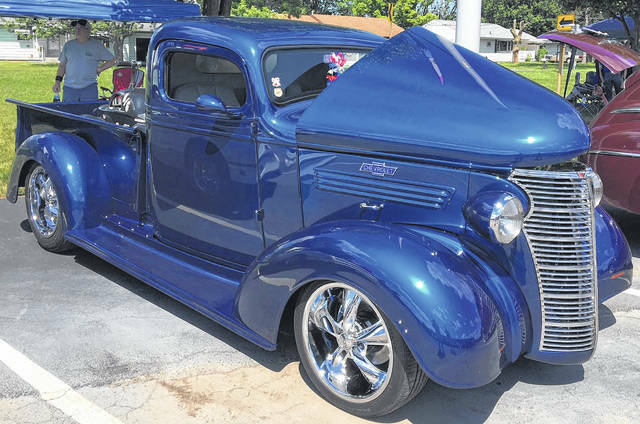 Brent Mitchell, of Findlay, built this 1938 Chevy Pickup with the help of his dad and his hot rod buddies. FINDLAY — Brent Mitchell, of Findlay, brought his 1938 Chevy Pickup to the Lima Chevrolet Cadillac Charity Car Show recently. “I built it to drive, me and my dad and his hot rod buddies,” Mitchell said. Mitchell drives the pickup everywhere and especially enjoys taking it to shows. The pickup, which is painted Indigo Blue, has won at the Cleveland Piston Power Show in 2016 and 2017, The Detroit Autorama and won honorable mention at the Shades of the Past show. The truck won a 6-foot trophy at a show in Upper Sandusky. Chevrolet is celebrating 100 years of trucks in 2018. The company has produced more than 85 million trucks in that 100 years. In 1938, Chevy produced the first truck by its new Art and Color department. The truck featured a redesigned grille, front bumper and swept fenders. Chevy emphasized the design aspect of the truck that year instead of the workability of its truck. Mitchell says he didn’t realize what he had until he started taking the pickup to shows. “You see Ford trucks, but not many Chevy’s,” Mitchell said.